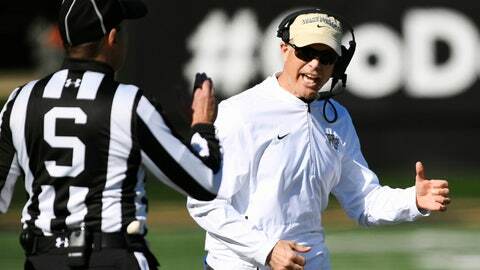 DURHAM, N.C. (AP) — Duke and Wake Forest have reversed roles from last year. The Demon Deacons (5-6, 2-5 Atlantic Coast Conference) need to beat their instate rivals Saturday to qualify for their third straight bowl. A year ago, the Blue Devils were the ones who needed a victory in the season-ending Interstate 40 rivalry to earn a spot in the postseason — and got it, rallying from an early two-touchdown deficit to win 31-23. Duke (7-4, 3-4) assured itself of a sixth bowl in seven years by winning its first two games in November, beating Miami and North Carolina before losing 35-6 at No. 2 Clemson last week. The pressure is on the Demon Deacons, who sandwiched a road victory at N.C. State with home losses to Syracuse and Coastal Division champion Pittsburgh. Both of the Demon Deacons’ conference victories have come on the road, winning at Louisville and at N.C. State while finishing 0-4 in conference play on their home field. Duke is 1-2 in ACC games at home, losing to Virginia and Virginia Tech but beating North Carolina. The Blue Devils have won five of the last six meetings, a run that coincides with their string of bowl berths, in the streaky series. Wake Forest’s lone win in that stretch came two years ago in its last visit to Durham. Last year was the first time that both small, private, academically elite schools earned bowl berths. Both quarterbacks should be able to let it fly without fear of a turnover. No school in the FBS has intercepted fewer passes than Duke (three). And Wake Forest could set an unwanted school record: The Demon Deacons have picked off just four passes. No team in school history has had fewer than five (1962). Both teams have been ravaged by injuries. Wake Forest has lost at least a dozen players to season-ending injuries, including QB Sam Hartman, a freshman who started the first nine games. Duke coach David Cutcliffe says his team has had 23 players miss games with injuries, including 15 with starting experience, with seven having season-ending surgeries.